A shortstop-runner collision and obstruction call in Arizona gave the Padres' baserunner a second life and gave us our latest UEFL Case Play. With one out and one on (R1) in the top of the 4th inning of the Mother's Day Padres-Diamondbacks game, Padres baserunner Justin Upton hit a line drive into right field. Shortly after Padres baserunner R1 Will Myers passed second base, he collided with Diamondbacks shortstop Nick Ahmed. At the time of this collision, the baseball was being fielded in right field. Shortly thereafter, R1 Myers, who briefly attempted to continue onto third base, was tagged. 2B Umpire Jim Joyce, meanwhile, had declared obstruction and, upon the conclusion of the play, awarded R1 Myers third base. Following a plea from D-Backs skipper Chip Hale, U2 Joyce convened his crew and sent Myers back to second base, prompting an unsuccessful argument from Padres Manager Bud Black (This is not the first time Black has unsuccessfully argued an obstruction call at second base). Play resumed with one out, R1 and R2. Case Play Question 2015-03: Was the umpire crew's ruling in placing the runner at second base correct? The broadcasters stated there was no obstruction. What rule(s) and call accurately describe what happened (e.g., was the obstruction call overturned, or upheld with a different penalty imposed)? Case Play Answer 2015-03: The determination of placing the runners is a judgment call and may be correct, if the judgment prescribed by rule was proper. Since replays indicate no play was being made on the runner R1 at the time of the obstruction, which occurred as the result of R1 being impeded by F6 in his attempt to run the bases, we turn to Rule 7.06(b) [OBR 2015 Rule 6.01(h)(2)], which states, "If no play is being made on the obstructed runner, the play shall proceed until no further action is possible. The umpire shall then call 'Time' and impose such penalties, if any, as in his judgment will nullify the act of obstruction." Thus, the umpires properly waited until the play's completion before enforcing the remedy of the rule. Had obstruction occurred while a play was actively being made on the obstructed runner (Type A obstruction), play would have been halted immediately upon the infraction ("Time" called). Rule 7.06(b) [OBR 2015 6.01(h)(2)] Comment states, "When the ball is not dead on obstruction and an obstructed runner advances beyond the base which, in the umpire’s judgment, he would have been awarded because of being obstructed, he does so at his own peril and may be tagged out. This is a judgment call." In other words, umpires would have been supported by rule had they declared R1 out when he was tagged attempting to advance to third base, since the umpires only awarded, or protected R1 back to, second base. Because this is a judgment call, umpires are authorized to impose any penalties that will "nullify the act of obstruction." 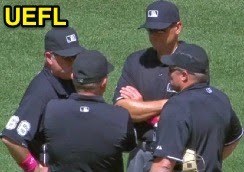 If the umpires believed R1 would have remained safely at second base had obstruction not occurred, then the decision to place R1 at second base is the correct call. Thanks to all participants, each of whom shall receive two points for discussion of this play.